Here are lyrics, melody line, and song notes to 136 songs. 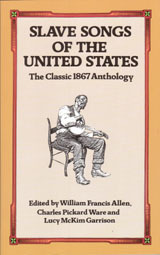 First published in 1867, this landmark book represented the first systematic effort to collect and preserve the songs sung by the plantation slave of the Old South. These songs were collected directly from the singers themselves. Here are rare PD versions of "Michael Row the Boat Ashore", "Nobody Knows the Trouble I've Had", "The Old Ship of Zion", and many others. PUBLIC DOMAIN STATUS: This is an unabridged reprint of a book first published in the United States in 1867. All the selections in this volume are in the Public Domain in the United States and should be PD in all other countries. Please note that only the lyrics and melody line music staff notes were included in this 1867 publication. No treble cleff/bass cleff piano arrangements are included.